How European Open Science Cloud (EOSC) will be governed is being designed now. EOSC pilot project, in charge of trialing and designing a stakeholder-driven governance framework for EOSC, is inviting research policy makers, research funders, service providers and scientists-researchers to take part in the debate and plan of the future EOSC. A workshop in this theme will be organised on the 2nd and 3rd of October, 2017 in Tallinn, in conjunction with the e-Infrastructures Reflection Group Workshop under the auspices of the Estonian EU Presidency of the European Union. The main governance challenge of establishing the EOSC is how to construct a framework allowing strong and disparate stakeholders to work together. This framework also needs to address cultural challenges, encouraging the adoption of new ways of working and scientific practices. EOSCpilot will design and trial a stakeholder-driven governance framework with the involvement of all stakeholders. This will then shape and oversee future development of the European Open Science Cloud. 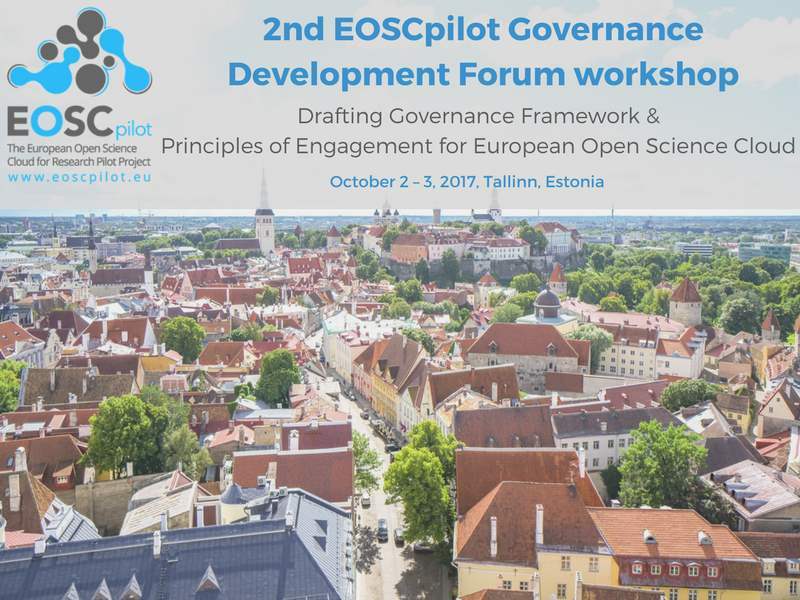 EOSCpilot has established a Governance Development Forum (EGDF) to enable all different stakeholders to contribute to the development of the EOSC governance framework. The EOSCpilot Governance Development Forum (EGDF) is mandated to function and support the establishment of the EOSC. This workshop is part of the forum activities. During the 1st day of the workshop the focus will be on Member states’ role and engagement in the EOSC governance framework. In the panel discussion we will hear about the national initiatives and development in the area of EOSC in different countries. The second panel will concentrate on principles of engagement from the point of view of using and providing EOSC services. During the second day of the workshop the activities of the EOSCpilot will be presented with the focus on EOSC service architecture and service portfolio management. Furthermore there will be a lessons learnt presentation of e-IRG Infrastructure Commons and interoperability. The workshop will finish at noon giving the floor tor the opening of the e-IRG workshop with the focus on the development and sustainability of European Open Science Cloud. EOSCpilot (2017-2018) supports the first phase in the development of the European Open Science Cloud (EOSC), as described in the EC Communication on European Cloud Initiatives. Engage with a broad range of stakeholders, crossing borders and communities, to build the trust and skills required for adoption of an open approach to scientific research.